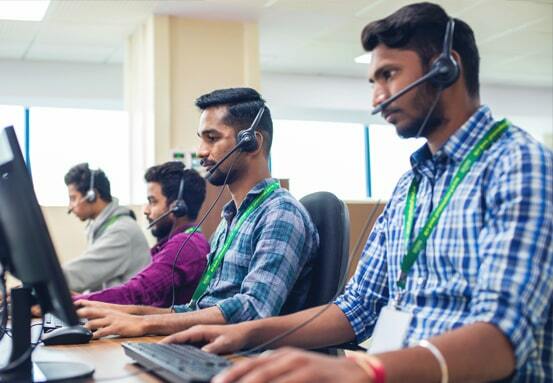 Greet Technologies is a growing Customer Support/KPO services provider in India, with focus on transaction processing as well as handling calls. Greet is here to deliver world-class solutions, which are result-oriented and committed to customer satisfaction. With a ' total solutions approach ', Greet works as an extended arm of your organization. Our ability to provide best-of-breed services derives from an expert knowledge of our business, as well as in-depth understanding of our clients' business and business processes. We possess a deep working knowledge of the technologies and processes that are crucial to successful business outsourcing and pride ourselves on our ability to provide end-to-end, scalable and result-oriented solutions. We invest substantially in acquiring industry expertise and providing our people deep industry training prior to receiving client-based training. We structure our pricing to align with client needs with no hidden costs. Global organizations can depend on our ability to rapidly set up and manage large scale complex processes over accelerated timeframes. Our growing suite of services is supported by a framework of rapid knowledge interchange which allows teams to absorb new capabilities and swiftly establish best practices. We have partnered with clients to create virtual extensions of their organizations so they can concentrate on their core competency. Our culture of responsiveness, flexibility, operations excellence, mutual trust and transparency has led to long-standing client relationships. Greet offers a healthy work environment in order to foster a feeling of belonging amongst employees and to facilitate personal growth as well as career advancement. This is complimented by a culture of professionalism, a commitment to meritocracy, an innovation driven organizational structure and lots of cross-functional work groups that result in real learning. We continuously strive to meet employee expectations, be it recognition and rewards, incentives and benefits, professional development or educational growth. Greet has created a performance driven culture with incentivized packages that improves performance and rewards performers. Our employees are our assets who believe in delivering the best, inspiring others, promoting teamwork and discovering their true selves. Our inclusive work culture is right defined by employees from diversified backgrounds with a collective aim to delighting our clients and creating memorable customer experience journeys. Every day my current role provides an opportunity to learn something new, to mentor and to be mentored, and to help our clients achieve their strategic goals. Lakshmi Devamma joined GREET more than a decade ago as an Accounts Process Executive. Today, she stands as the Senior Quality analyst. Lakshmi Devamma has grown from strength to strength in her role as a professional. She has handled different portfolios before taking over as Senior QA. Shivanand’s association with GREET started over a decade ago in his first role as a Front office Executive. Given his passion and ownership for work, Shivanand moved up the ladder steadily, gathering experience of handling different departments taking over as the HR Executive in 2011. Today, he stands as the Senior Executive-HR. Beginning my career with Greet has provided me the right opportunities that ensure professional growth in an employee’s life. What I truly appreciate is the respect that we give each other as employees. My efforts to perform to the best of my ability has earned the trust of my superiors who give me additional projects and the flexibility to maintain work/life balance. Working on a variety of projects has helped me grow professionally and build the confidence to face new business challenges.